We are consistently impressed by our Spiders who are recognized for their hard work and achievements, especially on an international level. 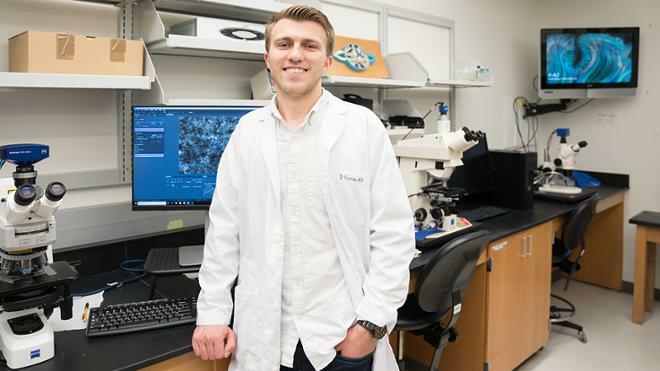 A recent example is Dmitry Kovalev, ’19, who is the only undergrad from a U.S. university to receive the competitive International Behavioral Neuroscience Society Travel Award. He will attend a professional conference this summer in Boca Raton, Florida, and present his research alongside PhD, postdoctoral and graduate students. Kovalev is a psychology and biology double major with a concentration in neuroscience. Funded by the School of Arts and Sciences, his research examines the social, hormonal and brain responses of adult rats born to mothers exposed to varying environments. The research is an extension of Dr. Kelly Lambert’s work. Congratulations, Dmitry! We are so proud that you will be representing us this summer!